A few weeks ago, the scientific journal ‘Nature’ published an article on the mapping of the quinoa genome . I was thrilled about this breakthrough and to see how the scientific community has embraced this interesting crop and acknowledged its potential as a healthy and nutritious source of food. For thousands of years, quinoa has been an essential food for people from the Andes in South America. Its nutritional properties are excellent with a high protein content and quality, several vitamins and dietary minerals, and is gluten-free. Meanwhile, it is an incredibly resilient crop that can grow in poor soils, salty soils, and at high altitudes and latitudes. For these reasons, quinoa was recognised by the Food and Agricultural Organization (FAO) in 2013 as a crop with the potential to contribute to world food security. This paper is an important contribution for the future role of quinoa. The DNA sequence information is extremely valuable for identifying key genes controlling important traits, such as drought and salt tolerance, and genetic variability among the cultivated varieties (cultivars) of quinoa. With the knowledge of the genetic information, breeders can reduce traditional breeding time by up to half. Improving quinoa’s tolerance and adaptability to various climatic zones will help spread the growth of quinoa even in some of the world’s most challenged regions. I look forward to continuing the work of PROTEIN2FOOD; developing innovative and sustainable plant protein food crops with a positive impact on human health, the environment, and biodiversity. Now helped along the way by this mapping of the quinoa genome. The history of plant proteins across Europe is a complicated and diverse one. Geographic and time trends of EU-28 countries suggest that many countries, traditionally reliant upon diets rich in plant proteins, substantially reduced their consumption and production from the 1960s to the turn of the millennium. These trends appear to have been influenced by socio-economic and cultural conditions. 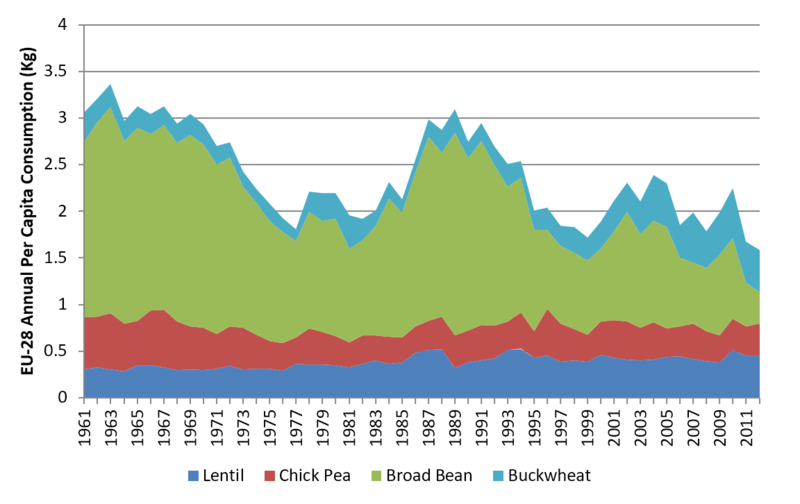 EU-28 policies may have encouraged production of these crops, especially over the last 15 years. However, factors including support offered to other crops, variable yields and low prices may have limited the expanse of their cultivation over the past few decades. Dietary protein from plants in Europe has been increasingly replaced by animal proteins, as observed by their consumption and production since 1961. This pattern of transition towards higher meat-dependence is evident globally. However, recent changes across some European countries suggest the beginning of a shift back towards plant and away from meat protein consumption; stemming from health concerns, economics and consumers choice. 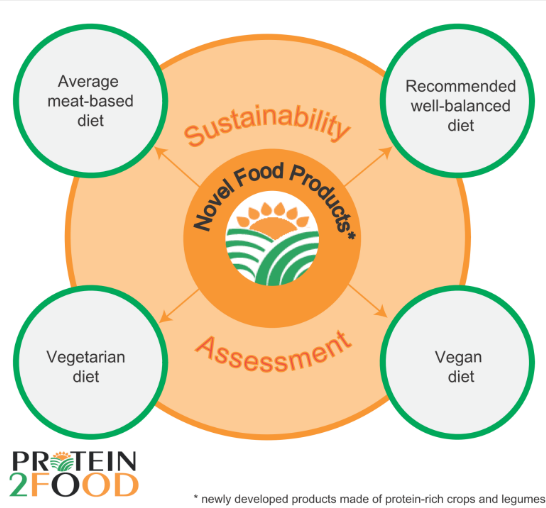 PROTEIN2FOOD is expected to provide a substantial contribution to the ongoing scientific and political discussions in the field of sustainable agriculture, by developing crop-based, protein-rich, and environmentally friendly alternatives for meat-based diets. These project aims were presented by Andreas Detzel (IFEU) with a poster titled; “PROTEIN2FOOD – a Horizon 2020 project on novel plant-based protein-rich food for fostering sustainable food consumption”, at the 10th International Conference on Life Cycle Assessment of Food. This event took place in October at University College Dublin (UCD) and involved the discussion of major topics related to sustainable agriculture and the contribution of human systems in the food chain, focusing particularly on different dietary patterns and the environmental impact they might have. 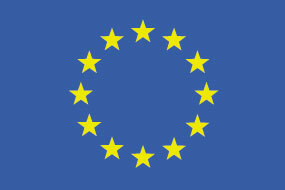 Ensuring future protein supply for food and feed was among the most highly discussed issues. A growing interest in locally produced, high quality protein foods has put the spotlight on legumes, peas and faba beans, as an attractive source of both protein and health promoting dietary fibres. 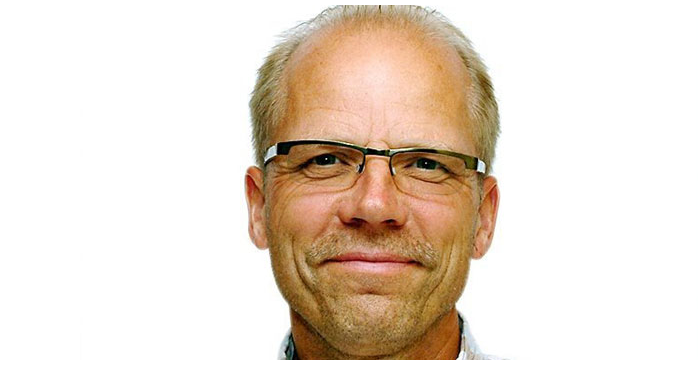 Within the PROTEIN2FOOD project, researchers at both the Swedish University of Agriculture (SLU) and the University of Copenhagen are investigating whether the proteins and fibres of peas can be isolated for the production of pasta products. Faba beans’ proteins and fibres have high potential too . 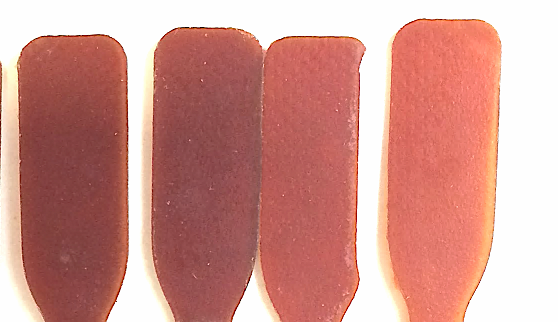 As an example, see these red pasta-like samples from pea protein and fibres. The idea is to understand how these components can be combined and how they interact when heated at high temperatures, like those in the pasta-making process. The researchers are also interested in understanding what structure and mechanical properties (chewing strength) work best to make enjoyable fresh pasta-like products with desirable characteristics. These pea-based pasta sheets could be a promising new food with potential nutrition and health benefits. Cow´s milk allergy and malabsorption of lactose are common conditions that can remain with some people for their whole lives. Therefore, beverages based on plants could be an interesting alternative. 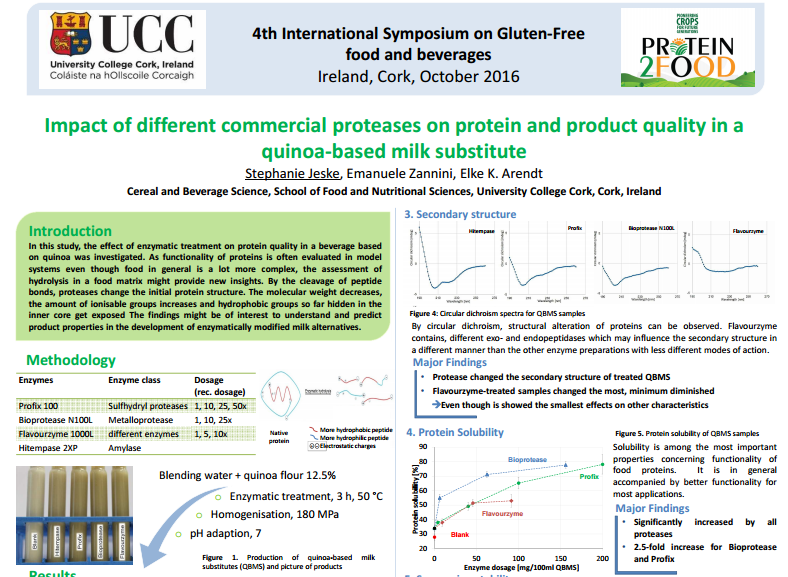 University College Cork (UCC), partner of the PROTEIN2FOOD project, studied the impact of enzymatic treatment on protein quality in a beverage based on quinoa, a protein-rich crop. They found that there was an increase in protein solubility, decreased sedimentation, and improvements in taste and flavour after the addition of proteases (enzymes that break down protein). This research will be useful for developing a quinoa-based product with the desired protein properties and quality to replace cow’s milk in the diet. 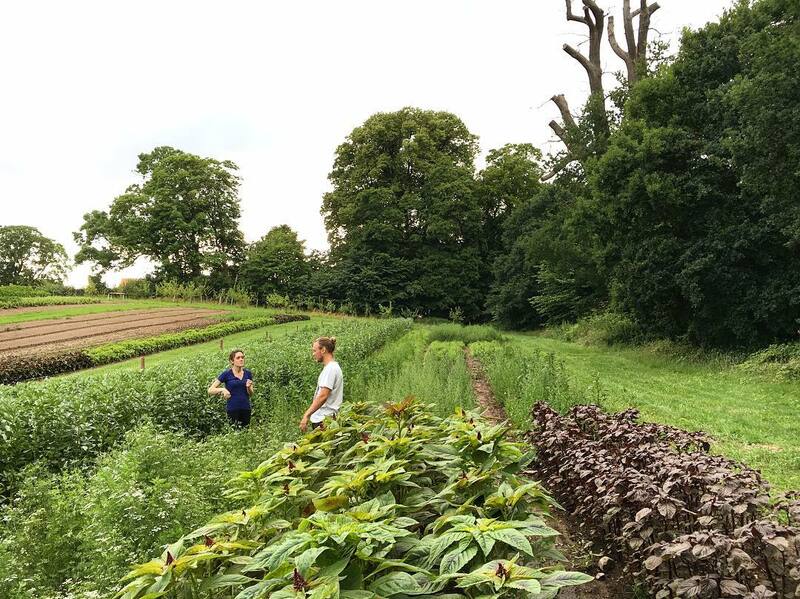 PROTEIN2FOOD has been working closely with the Aarstiderne farm in Denmark to develop prototypes of protein-rich crops. They have grown over 100 new varieties of vegetables, including the protein-rich crops: quinoa, amaranth, millet, horse beans, lentils, and lupin. Aarstiderne is an exciting Danish initiative promoting short supply chains, bringing food from farm to the dinner table, by delivering directly to households and local restaurants. It has allowed for PROTEIN2FOOD to get involved in the culinary sector as local restaurants show an interest. Such as restaurant 108, which has already started purchasing their products and using them in a variety of meals! Do you want to learn more about the latest research from the PROTEIN2FOOD project, and discuss opportunities for collaboration? Then participate in our Stakeholder Forum on May 30th 2017 in Caserta, Italy. Here, PROTEIN2FOOD members and stakeholders will gather for presentations and discussions on innovative, sustainable plant proteins for human consumption. 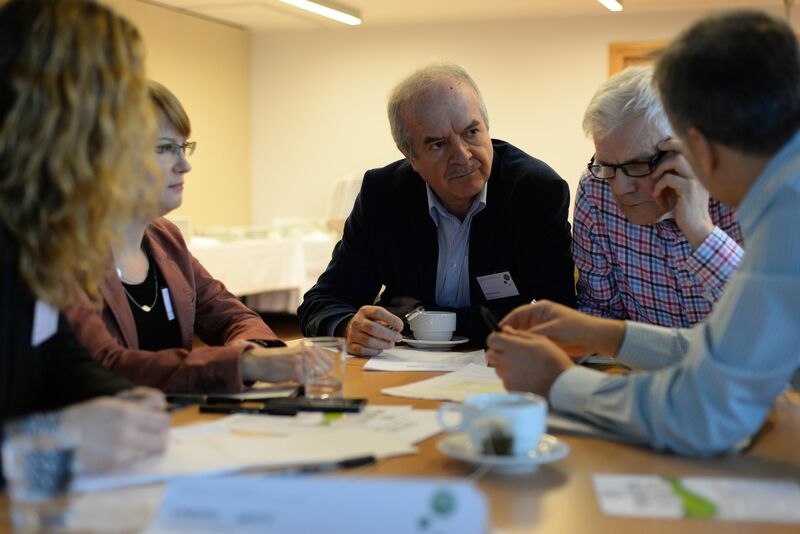 If you are interested in participating, or becoming a stakeholder, in PROTEIN2FOOD then you can find more information here.